ClimeFish aim to forecast the effect of future climate scenarios on the biological parameters (spawning, recruitment, growth, migration and trophic interactions) that determine the production and distribution of the most important and less resilient exploitable species found in marine and freshwater systems across Europe. Biological predictions are obtained at the case study level, while integration at the sector (marine fisheries, lakes and ponds and marine aquaculture) and European levels will be executed at a later stage of the project. Predictions of climate change effects has been made for 14 ClimeFish case studies, spanning marine fisheries, freshwater lake fisheries, freshwater and marine finfish as well as marine shellfish aquaculture throughout European waters. Biological forecasts are obtained for two climate scenarios (RCP4.6 and RCP8.5) and four time intervals (2006-15, 2016-25, 2026-35 and 2046-55) by combining physical climate models and food web or individual based models. In marine fisheries, climate change effects involve both species increase and decline and are often modified by predator-prey interactions. Freshwater fisheries and aquaculture tended to benefit from climate change, whereas the climate change effects on shellfish aquaculture are uncertain. Marine aquaculture was predicted to benefit from climate change for warm-water species; in the case of salmon, warming waters slightly shift the suitability of aquaculture sites at higher latitudes. Annexed reports and databases for each case study were elaborated and formatted according to the needs of the socioeconomic WPs of ClimeFish. ClimeFish considers three types of case studies: reference, simulation and implementation (Table 1). The biological predictions for the simulation case studies will be used by the socio-economic WP4 to identify risks and opportunities and develop early warning methodologies. The analysis of WP4 will be exploited by WP5 to develop management plans (MP) that mitigate risk and utilize opportunities. For the particular case of the implementation case studies, dedicated decision support systems (DSS) will be developed by WP7. Biological predictions for the implementation and simulation case studies will undergo an iterative loop; a first set of early predictions is used by WP4 > WP5 > WP7 to produce initial MP (for the simulation case studies) and DSS (for the implementation case studies) that are presented to each case study stakeholders by WP6. After this first loop, taking into account stakeholder feedbacks and ongoing model developments, biological predictions will be refined and final MP and DSS will be presented again to stakeholders by WP6. Table 1. Classification of ClimeFish case studies according to sectors and interaction with other WPs (reference, simulation and implementation). 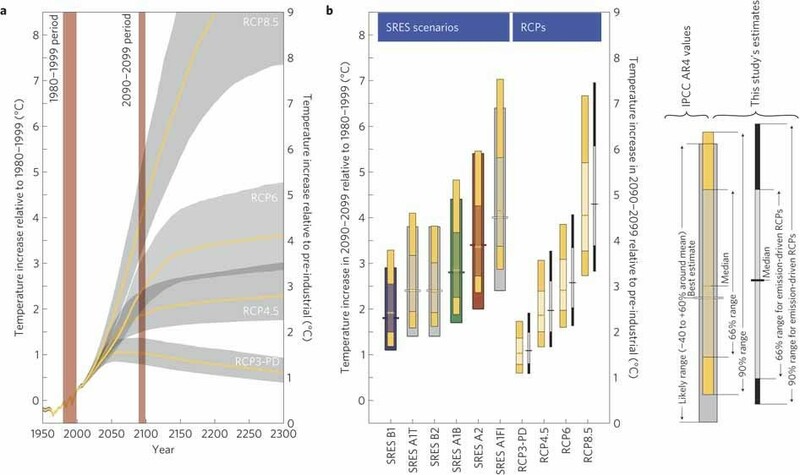 ClimeFish aimed to base its projections on the RCP2.6 (optimal), RCP4.5 (likely) and RCP8.5 (worst) greenhouse gas representative concentration pathways adopted by the IPCC for its 5th assessment of climate change. An analysis of the time course of the actual CO2 emission reveals that currently we are already following the worst scenario predicted by the IPCC. Consequently, it has being agreed to omit RCP2.6 and make projections only for RCP4.5 and RCP8.5. Biological predictions for all case studies are provided for the four time intervals requested by the ClimeFish socioeconomic WPs: 2006-2015 (validation period), 2016-2025 (short-term), 2026-2035 (middle-term) and 2046-2055 (log-term). This approach, providing model results at decadal intervals rather than for the individual years 2015, 2020, 2030 and 2050 provides more reliable and robust predictions. Furthermore, the approach also allows 1) testing how climate interanual variability propagates to biological simulations, i.e. it is a kind of sensitivity analysis of biological models performance; and 2) analysing the significance of the difference observed between climate scenarios (RCP4.6 and RCP8.5) for each time interval. 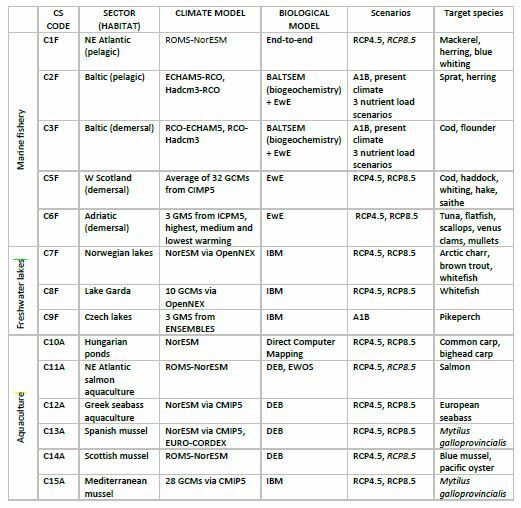 The table below shows the climate and biological models applied in the ClimeFish case studies, together with the climate scenarios simulated. The species included from each of the case studies are also listed. All marine case studies reported species shifts under climate changes, with some species, often planktivores, increasing in biomass, and others, often cold-water demersal species declining. One case study, the NE Atlantic (C1F), reported an emerging fishery opportunity, i.e. Calanus finmarchicus as a potential target species. Freshwater lake fisheries were predicted to benefit from climate change, since the main target fishes in the lake case studies grew faster in warmer waters. Similarly, climate change had positive effects on the aquaculture of warm-water finfish, e.g. seabass (C12A), whereas in the NE Atlantic salmon aquaculture (C11A) warming affected southern sites slightly negatively, while northern sites became more suitable. Climate change effects on shellfish aquaculture were difficult to predict, partially due to the unknown future food availability. Risks of climate change mentioned in the case study reports include the unknown side effects of developing new commercial fisheries (C1F), the potential decline of cold-water species (C5F, C6F), as well as slower growth in salmon aquaculture (C11A) in southern sites. In some cases, reduced growth in length might lead to unintentional fishing of juveniles (Lake Garda, CF8). Other risks in freshwater case studies are declining oxygen conditions and increased water consumptions (Hungarian ponds, C10A). Also increased inter-annual variability (C11A), and an increased risk of harmful algal blooms (C13A) were mentioned in the case study reports. Below are the summary of the first round of forecasts. 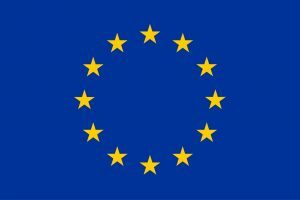 You can read all the details in the Deliverable 3.2 that will be available here when it has been approved by the European Research Council. Setting fishing mortalities to MSY changes fish stocks and catches compared to the recent past. 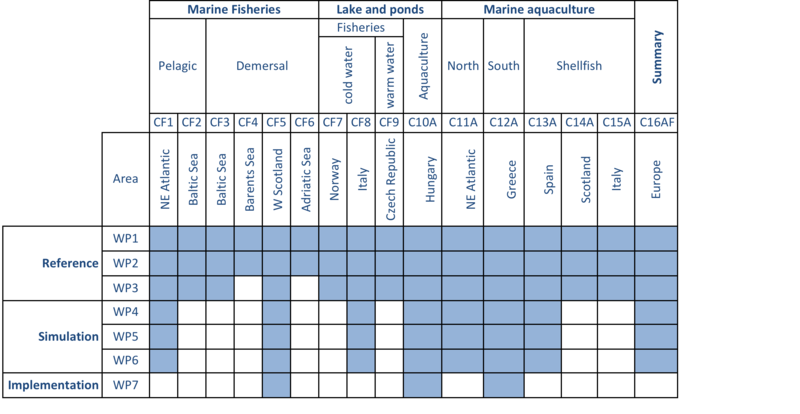 These changes overlay the climate effects in all fishery case studies except the Adriatic (C6F), where fishing mortalities were assumed to remain at present levels. Climate change affects fish directly by shifting water temperatures with respect to species thermal preferences. This is particularly important for species with a narrow temperature range or cold-water species at the edge of their distribution area. For example, cod and haddock on the west coast of Scotland (C5F) are expected to decline at the end of the RCP8.5 scenario with no concurrent increase in warm-water species. Similarly, the flatfish group in the Adriatic (C6F) – mainly boreal species – is predicted to decline strongly. Climate change was simulated to increase zooplankton productivity and thus enhance the food supply to planktivorous species. Both in the NE Atlantic (C1F) and the Baltic Sea (C2F) the productivity effect is more important than direct temperature effects on growth and reproduction. Whether the higher food supply translate into larger stock size depended on the strength of predator-prey interactions. While mackerel and blue whiting are predicted to increase in the NE Atlantic (CF1), higher cod predation are predicted to reduce sprat biomass in the Baltic Sea. In the species-rich Adriatic Sea (C6F) biomass and catches for most native demersal species were predicted to decline, whereas invasive demersal species were predicted to increase. All marine case studies had difficulties in addressing changes in the spatial distribution of species. Except the NE Atlantic (C1F) all marine fishery case-studies used 0-dimensional foodweb models. C1F showed differences in the spatial distribution and production of plankton species. Migration pathways for pelagic fish did not depend on the environment in the present model version; therefore the simulation of spatial changes was considered still incomplete. All freshwater case studies, either of cold (C7F, C8F) or warm (CF9) waters, predict an increase in growth of their target species, in particular for whitefish (C7F, C8F) and pikeperch (C9F), but to a lesser extend also for salmonids (C7F). Significant interactions between climate change and fishing mortality are predicted for whitefish. For the case of carp aquaculture in the Hungarian ponds (C10A), an increase in both plankton and carp biomass for the tested RCP4.6 climate scenario is observed. This positive effect is accompanied by some undesirable effects as the increasing water demand (increasing fixed costs), occurrence of low oxygen levels and mortality events. Both marine finfish aquaculture case studies (C11A, C12A) report both biomass increase and decline depending on the sub-area under consideration. It is predicted that the NE Atlantic salmon aquaculture (C11A) will experience faster growth at higher latitudes (Northern Norway), whereas it is expected to decline slightly for the lower latitude Scottish farms. In the Greek seabass aquaculture (C12A) fish are predicted to grow slightly faster and farm biomass will increase in the RCP4.5 scenario, while some growth retardation was observed at the end of the RCP8.5 scenario. Interestingly, no significant changes are observed between RCP scenarios or stocking months with respect to feed consumption. In any case, both case studies report that the expected changes in time to reach harvest size are minor and can be controlled by farming practices. Three case studies covering a wide range of latitudes are devoted to marine shellfish aquaculture (C13A, C14A and C15A). Given that shellfish are filter-feeders that feed directly from the environment, the impact of climate change on these organisms is not only related to their physiological response to temperature but also by the effect on food availability. The effect of seawater temperature increase on shellfish growth has been modelled in the three case studies, with contrasting results: whereas a slight increase in the time to reach the commercial size was reported for the W Scotland and Adriatic Sea case studies, a slight decrease was observed in the NW Iberian area. Difficulties of obtain high spatial resolution food availability predictions (chlorophyll a, suspended organic matter) for the three study area have not allowed to properly assess the impact of food availability on future shellfish growth at the present stage. Ecosystem interactions were mostly reported in the marine fishery case studies, where it seems particularly important how climate change affects the biomass of predatory fish, e.g. cod. Both in the Northern Adriatic (C6F) and the Scottish shelf (C5F) cod biomass is expected to decrease, with cascading effects on forage fish. In the Baltic Sea (C2F, C3F) changes in cod stock were both fishery and climate related, with large effects on sprat and herring biomass. Food-web models tended to focus on existing species, i.e. ecologically important species with large biomass under present climate conditions. Only one case study, the Northern Adriatic (C6F) explicitly provided for invasions of thermophilic species and found, that species invasions in climate change scenarios actually led to an increase in fish stocks and catches. Few ecosystem interactions were described in lake systems, even though some target species included top predators such as pikeperch in the Czech lakes (C9F). Lake and aquaculture studies also tended to disregard productivity changes, except for the Hungarian pond aquaculture (C10A). Only the Mediterranean mussel aquaculture (C15A) mentions that changes in mussel metabolism might affect sedimentations of faeces, sediment biogeochemistry and bottom water oxygen conditions. The magnitude of changes is, however, unknown.